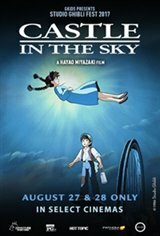 Fathom Events and GKIDS are partnering to bring Hayao Miyazaki's Castle in the Sky to select cinemas nationwide for a special two-day event on August 27 & 28 as part of Studio Ghibli Fest 2017. From the legendary director comes the story of a young girl who falls out of the sky and into the arms of young Pazu. Together they search for a floating island, the site of a long-dead civilization promising much to those who can unlock its secrets. Dubbed in English on August 27 and subtitled on August 28, this special two-day event will also include an exclusive edition of GKIDS MINIFEST, an ongoing festival of award-winning short animated films from around the world! "One of my childhood favourites, it was great seeing the movie in theatres. The only downside was that quite a few lines were removed/missing from the movie that made for noticeable silences for anyone that knows the movie"
"One of my favourite movies!" "Amazing movie, fantastic animation and a truly moving storyline."